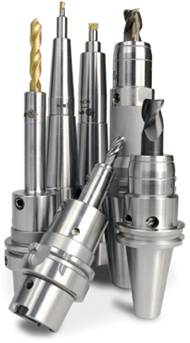 Performance Tooling is the exclusive SPV-Hydraulic Tool Holders and Tapping Systems and Accessories, Centreline-Right Angle Heads and Speed Increasers, Wendel-Driven Tools for Turning Centers and Swiss Machines. All tooling information is listed below. To view, simply click the arrow on the left-hand side of each catalog name to open and view the information you are specifically interested in. To close, simply click on the same arrow again to collapse the menu. 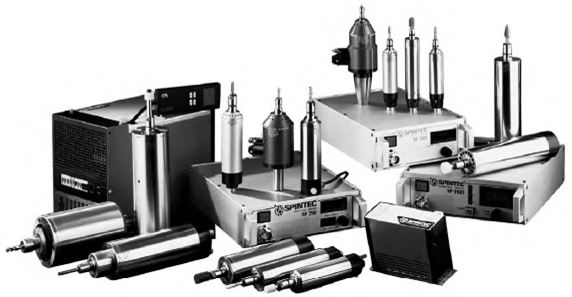 SPV Spintec is a pioneer in terms of tapping chucks and devices. We have customers that has tapping chucks which they purchased over 40 years ago and they still use them in production. We still manufacture and perform service on those chucks today. 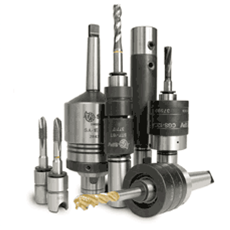 Our wide assortment covers everything from manual, conventional to synchronous threading in NC machines. 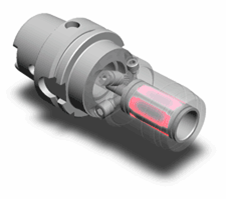 We have tapping chucks for both internal and external cooling. We also have a very wide assortment of tap adaptors and accessories. Our tap adaptors can be provided with or without internal cooling. For blind-hole tapping you can get the adaptor with a built-in torque clutch. All SPV Spintec Tapping Attachments are designed to give full profile as the axial-floating tap driver spindles run on ball bearings. Giving the best thread quality profile. SPV Spintec's Hydraulic Chucks are made to meet the highest standards and withstand the toughest conditions and environments. We offer you the widest range of hydraulic chucks in the market - available for all applications. Take a closer look at our unique hexagonal milling membrane which allows tough and vibration free milling compared to regular hydraulic chucks. 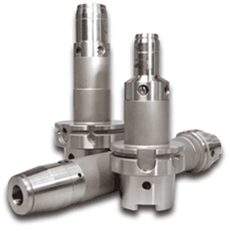 SPV Hydraulic Toolholders range from Stub style up to 500mm in lengths. Pen Style or Standard lengths. All Toolholders are available in BT, CAT, and HSK tapers. Inch or Metric I.D. Thanks to our unique system we can provide extended chucks up to 500mm. SPV Spintec are specialists in making customized hydraulic chucks to fit your needs. For Heavy Milling Applications select the innovative Milling Membrane clamping option. By clamping along the length of the tool instead of the common 2 bands of clamping. The Milling Membrane will give 2-3x higher clamping force over standard Hydraulic Toolholders. The limit in using hydraulic chucks has many times been to work with recommended cutting data for tougher milling. The customer often has to use extra short chucks with increased torque. 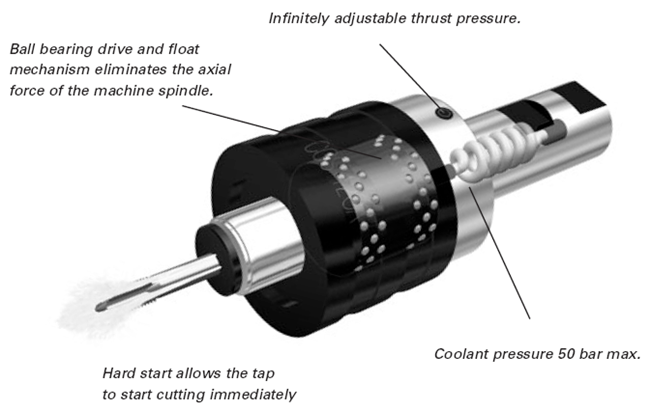 SPV has eliminated this demand and offer our clients the possibility to use our hydraulic milling chuck, which will save both time and money. with Mälardalens University they did a FEM-analysis, based on 3D-models to verify the performance and compare the new design to a traditional hydraulic chuck. The analysis showed very positive stress concentrations in the calculations which explained the polygon membrane's ability to minimize vibrations during operation. in Fagersta was made in spring 2003 as an attempt to verify the limits of cutting data. The results showed us that hydraulic chucks equipped with the milling-membrane managed to work with up to twice the recommendations of cutting depth. 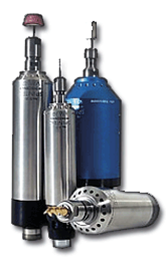 SPV Spintec's spindles and motors are developed to handle the toughest demands. Our spindles are available in different models and designs, covering a wide range of effect. The spindles can be delivered with air pressure cooling, oil mist lubrication and for the larger models, water cooling. 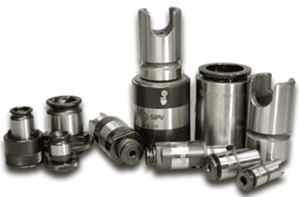 SPINTEC spindles are designed for clients with high demands on accuracy and reliability of service. The spindles are manufactured with the highest accuracy. All rotating parts are dynamically balanced and exchangable without impairing the tolerance of the spindle. SPV also carries out the service of all spindles. The SPINTEC range of high frequency spindles helps you to renew and adapt your machinery to modern tools that need high working speeds. The spindles can easily be clamped into existing machines. SPINTEC has a range of compact electronic converters to power the spindles. These have adjustable controls which enables the setting of optimum cutting speeds. Thermal and overload cut-outs are incorporated. - C1 Turning Toolholder Axial for Square Tool R.H.
- C2 Turning Toolholder Axial for Square Tool L.H. - C3 Turning Toolholder Axial for Square Tool Overhead R.H.
- C4 Turning Toolholder Axial for Square Tool Overhead L.H.